This ring is handmade in 18 karat yellow gold. Chiseled flowers with a matt and shiny polish. It is set with diamonds of app. 0,17ct, violet sapphires app. 0,31ct, blue sapphires app 0,9ct and pink sapphires app 0,19ct.Its weight is app. 2,5grm. This ring is handmade in 18K yellow gold. Chiseled flowers with a matt and shiny polish. It is set with diamonds of approximately 0.17 ct, yellow sapphires 0.31 ct approx., Tourmaline paraibas 0.9 ct approx. and pink sapphires 0,19 ct approx. Its weight is 5 g approx. This pair of 18 karat handcrafted yellow gold earrings app. 10grm, are set with white diamonds app. 1,13ct. Bell-back Alpa fastening for pierced ears. This handcrafted pair of 18 karat yellow gold earrings app. 3grm, dotted with light-catching diamonds. Post fastening for pierced ears. This handmade pair of 18 karat yellow gold earrings app. 12grm, are set with rubellite tourmalines and amethysts. Post and clasp fastening for pierced ears long dandling. 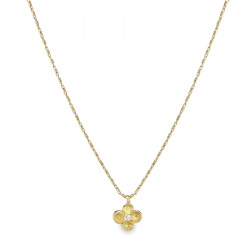 This one-of-a-kind necklace is expertly crafted by hand from 18 karat yellow gold app. 54grm, set with diamonds in total app. 2,01ct. It is entirely articulated for great comfort. It has a T-bar fastening. Award-winning creation. This chain is 18 karats yellow gold app. 2grm. Wear it layered with other pieces. Clasp fastening. 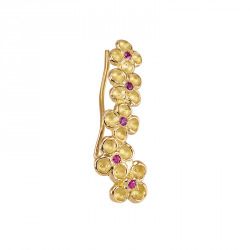 This ring is handcrafted in 18 karat yellow gold. Chiseled flowers with a matt and shiny polish. It is set with diamonds, clear, medium and intense violet sapphires of app. 0,71ct. The ring band is moveable in order for the flowers to position themselves nicely on the finger for a real comfort. Its weight is app. 2,5 grm. This one-of-a-kind bracelet is expertly crafted by hand from 18 karat yellow gold app. 48grm. It is set with diamonds in total app.1,47 ct. Its width is app.5cm and inside diameter is app. 5,9cm. It is hinged and has a pin that holds it closed. Award-winning creation. This handmade gold earring is made for a pierced ear. This single earring is sculpted to follow the curve of your lobe. It is 18 karat yellow gold app. 2,5grm, set with white diamonds.This jewel is made for the left ear.Its sold individually. 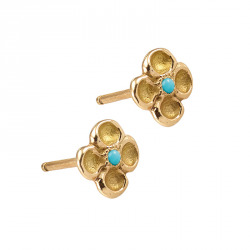 Pair yours with another single stud from the collection Golden Foliage, Petal earring. This ring is handmade in 18 karat yellow gold. Chiseled flowers with a matt and shiny polish. It is set with diamonds of app. 0,07ct. Its weight is app. 2,5grm. This chain is 18 karats yellow gold app. 3,5grm, it is set with a diamond in the heart of the flower. Wear it layered with other pieces. Clasp fastening. This handmade pair of 18 karat yellow gold earrings app. 2grm, are set with turquoise. Butterfly fastening for pierced ears. The choice of stones may be done on special request. This ring is handmade in 18K yellow gold. Chiseled flowers with a matt and shiny polish. It is set with intense pink sapphires, approx. 0.71 ct. The ring band is moveable in order for the flowers to position themselves nicely on the finger for a real comfort. Its weight is 2.5 g approx. This ring is handmade in 18 karat yellow gold. Chiseled flowers with a matt and shiny polish. Its set with a blue violet tanzanite of app.5ct. Its weight is app. 5grm.